Oats cooked in semi skimmed milk and water with sugar. Our oats are grown and specially selected by Scottish farmers. 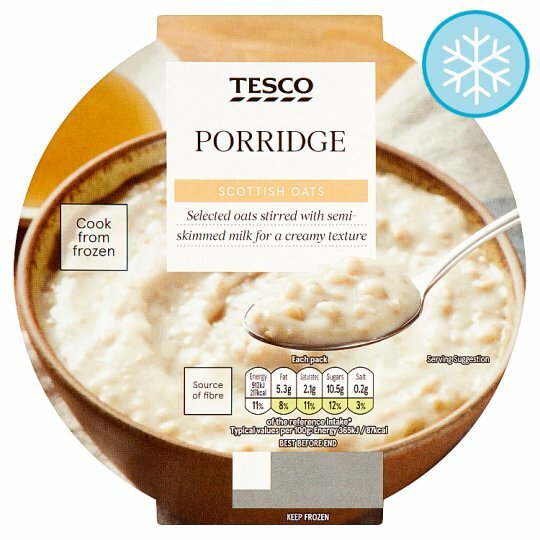 Our recipe combines the right balance of oats, semi skimmed milk and a touch of sugar for a fuss free, nutritious breakfast. Semi Skimmed Milk, Water, Oatmeal, Sugar. Contains milk and gluten. For allergens, including cereals containing gluten, see ingredients in bold. Instructions: For best results heat from frozen. Heat on full power for 2 minutes 30 seconds (800W) / 2 minutes (900W). Peel back film lid, stir well and re-cover. Heat on full power for a further 1 minute 20 seconds (800W) / 1 minute (900W). Heat on full power for a further 30 seconds (800W) / (900W). Caution: When removing lid after heating hot steam may escape.